Hello, friends! I’ve not wanted to make a monthly list as much as I don’t want to make one now. Super busy at work, doggie troubles and so much to do before going on vacation in just shy of three weeks. But the list must go on. 1) Food is always a good place to start and I am sooooo happy to report that I’ve mastered the recipe for Thai curry. Taking a virtual bow. 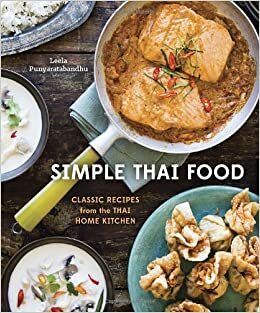 I followed a recipe from my cookbook Simple Thai Food and tweaked it a few times (less fish sauce, less chicken stock, more curry paste, even more curry paste) to get it the way I like it. It’s not San Francisco Thai restaurant quality, but it does beat out the local options we have here so I’ll take it. But it is a pain to make so there’s that. 2) I keep finding Ken’s head in strange places. Here he is, under the kitchen table. I’ve found his body behind the dollhouse in my littlest’s room and his head was behind the dresser in her room the other day. You tell me. 3) Why is it that only this year I am hearing about paczki? Does everyone but me know what that is? It’s not something I ever had in Hawaii or California, but apparently you eat it around Mardi Gras and it has some kind of jelly-filled center, which sounds very unappealing to me, but I still feel like I need to try one just because. In Hawaii we have malasadas, which I believe to be the most superior version of fried dough. I will confirm, once I’ve tried a paczki. 4) In December I met up with Kacy Johnson who is doing a fantastic portrait project, written up in Vanity Fair Italia and Huffington Post, called FEMALE, where she takes shots of women’s backs. I was her first Detroit photoshoot and she published the photo this month. She had just moved from San Francisco to her home studio in Detroit, so we had that in common and she really was just a lovely person and as sweet as can be. Her dog Caju (cashew in Portuguese) kept us entertained. The shoot took all of two minutes. I thought it was a great experience. If you are in the Detroit area, she is still looking for subjects, no prerequisites, and I urge you to give her a call to participate. 5) Our big girl turned eight this month. We celebrated over the weekend on the most beautiful February day ever, thanks to global warming. It was nice to be outside for most of the day. I raked a bunch of leaves and dug up some plants and the girls played with the the new archery birthday gift from Grandma. She chose to go to the Red Crown for dinner because she loves getting their milkshakes and burgers. I’m surprised more places around here don’t serve milkshakes. 6) As an early birthday present, my mother-in-law and I took the girls to see The Lion King at the Detroit Opera House. I’d never been inside the building and of course it was so beautiful and the play was so fun. 7) We met up with our bowling group one evening at Marais. The idea was to eat in the bar area, but it was packed on this particular Friday night and there wasn’t room for all eight of us. I could go on and on about the horrible service, but I will just say that it took forever and a day to get us seated (there were about three other tables?) and we waited over an hour for food. My small side order of french fries came out first and everyone was SO hungry by this point (10 o’clock?) that I passed it around we each had a few. However, the seafood platter was worth the wait. So fresh, so good. And by the time I had several bites of crab, shrimp and lobster in my belly, they were forgiven. But only just, so I hope they figure things out soon. 8) Speaking of margaritas (my friend across the table at Marais was drinking them that night), I finally made my own simple syrup! The thought of doing it was way more annoying than actually doing it, which was of course one of the easiest things I’ve ever made. It’s basically boiling water. I added ginger to the mix, to give it some zing, but I should have grated it more or left it in longer, because I can’t quite taste it. I’ve had about five homemade vodka gimlets since then, some good some bad, and last night I made a margarita-ish version with tequila and Contreau. Perfection. 9) Speaking of vodka gimlets, I had one on my Valentine’s Day date at Chartreuse, still one of our favorites. The appetizers were delectable, the entree was…as expected and the desserts, exquisite. They added basil syrup to their vanilla pudding, an addition we didn’t love, but it was still so good. I’d go back just for the pudding. 11) Our work team went on a field trip to scout potential event spaces for our live auction. One spot was a renovated (still in process) old factory building in Corktown and another was a design space called dPOP! in the historic Chrysler House downtown (Quicken Loans building now). One of the rooms is an actual bank vault, where we’re thinking about doing a wine tasting/happy hour event. Pretty cool. 12) Woo-hoo! Made it to the end of the list in record time! I leave you with this photo of my mom’s rose plant. I think it was taken last month or even earlier, but I’ve been thinking about Hawaii a lot because we are going for spring break – yippee! It’s Kimberly! Not Anonymous! Ha. Sorry I didn’t fill out the info! Sam’s okay, but will need surgery next week that will disfigure his face. Waaaaaah. So sad. As always, I love these lists! I can’t believe Penny is 8. Time flies when you’re having kids! Why is work so crazy? Just a busy time? Our deadline for the auction catalog is coming up and I write all the text for it. We have hundreds of items, plus several live auction items, that need scripting. GAH! It’s fun, but busy. Plus all the mom stuff. Miss you! Ahahaha. You don’t like seafood? It’s sooooo good. Oh no, I could never eat seafood but growing up on a lake in Michigan, I have a love of many kinds of fish!! Great post, nice to see you back! !